The two-day Investment Forum in Russia’s resort city of Sochi came to a close on Tuesday, becoming "a major winter forum" or a winter counterpart to the well-known St. Petersburg International Economic Forum, according to Prime Minister Dmitry Medvedev, RBC business daily writes. The most important message conveyed by officials attending the event is that recession is over and revenues from crude oil have started flowing into the public purse once again, but economic growth rates need to be accelerated, the paper wrote. 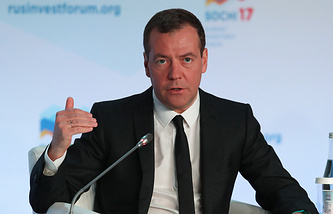 Prime Minister Medvedev’s meeting behind closed doors with business representatives on the first day of the forum was held "positively" in general, its participants told RBC. "Business understands that the economy has started rebounding. So, the big question is how to keep those reserves built up over the past years at some enterprises," said Director General of the Russian Direct Investment Fund (RDIF) Kirill Dmitriev. 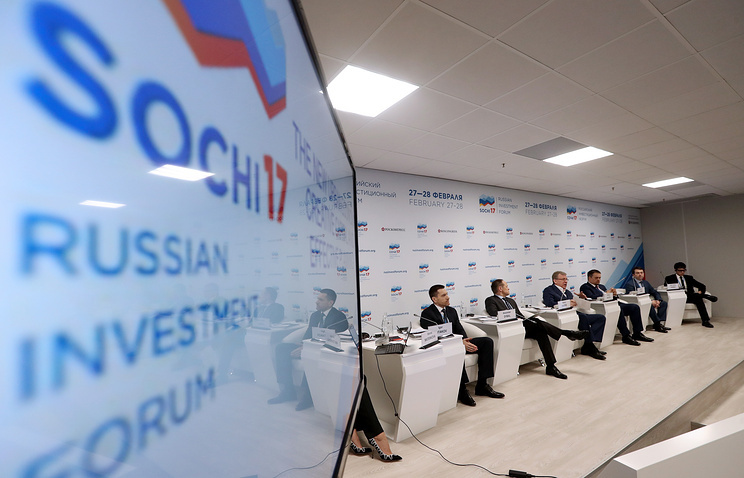 The Sochi platform was also the first one where businesses, officials and experts had a chance to discuss the latest ideas regarding taxes. But in general, the entrepreneurs at the forum requested that business climate must be predictable. "We need to know that nothing will change," said the former co-owner of Wimm Bill Dann dairy producer and investor David Yakobashvili. This will be one of the key trajectories of the government’s economic plan up to 2025 - to ensure stability for business, including stable system of tax and non-tax payments, the prime minister said in Sochi. Although Russia’s authorities want to make Sochi a Russian counterpart to Switzerland’s Davos, this year the forum has drawn 15% less business tourists from Moscow than last year, said Aeroclub, a company that specializes in business travel for corporate clients. "The lingering crisis has limited the resources of companies and definitely affected the choice of events to visit," the company said in a press release. However, in general, the dynamics of visits remains positive: this year the Sochi forum was attended by 5% more staff members of Russian and foreign companies than last year. This occurred as St. Petersburg-based companies tripled their presence at the forum, and many participants have also come from Crimea’s Simferopol. The deals inked at this year’s forum in Sochi are worth 200 bln rubles ($3.4bln), without taking into account the agreements that cannot be revealed since they are classified, Deputy Prime Minister Dmitry Kozak said. Last year’s deals totaled more than 700 bln rubles ($12bln at the current exchange rate). But since then the event was transformed from the International Investment Forum into Russia’s Investment Forum. Russian Foreign Minister Sergey Lavrov plans to meet with Libya’s Prime Minister Fayez al-Sarraj in Moscow on March 2, sources close to Russia’s Foreign Ministry told Izvestia. The Libyan politician’s visit comes amid the ongoing political crisis in the North African country and has the goal of involving Russia in settling the conflict, the paper writes. Mass media reports earlier claimed that Russia has taken the side of the authorities in eastern Libya. However, First Deputy Chairman of the Russian Federation Council’s Foreign Affairs Committee Vladimir Dzhabarov told Izvestia that speculation that Moscow tends to back either side is groundless. "We are working with all political forces that reject extremist and terrorist ideology. Our line has the goal of preserving the territorial integrity and stabilizing the country that has in fact ended its existence after the well-known events. Therefore, we will work with both Tripoli and Tobruk to reconcile the conflicting sides," the senator explained. A source in Libya’s army told Izvestia that the country’s Armed Forces do not consider that the visit of Fayez al-Sarraj to Moscow confirms a change in Russia’s line. He hoped that Moscow will persuade the prime minister to give up attempts to settle the crisis without taking into account the interests of some leading Libyan politicians and start cooperating with the army and the parliament. Director of the Arab Center for Research and Analysis in Geneva Riyad as-Saydaui said Moscow could act as a mediator and contribute to bringing closer the positions of Khalifa Haftar and Fayez al-Sarraj. "The first person controls a significant part of the territories and has the people’s support, and the government led by the second individual is recognized by the international community. The grounds for rapprochement between them may be zero tolerance to terrorists from the Islamic State and the Muslim Brotherhood (both organizations are banned in Russia)," he said. The latest attempt to bring the conflicting sides to the negotiating table was made in mid-February by Egypt. However, Cairo failed to convince Fayez al-Sarraj and Khalifa Haftar to start direct consultations. Moscow, which maintains constructive relations with both parties to the conflict, could achieve greater success in this field, according to the paper. The ultimatum put forward to Kiev by leaders of the self-proclaimed Donetsk and Lugansk People’s Republics expires on Wednesday. If the railway blockade of Donbass is not lifted, they threaten to take custody of all enterprises under Ukraine’s jurisdiction in Donbass and also to stop supplying Kiev with coal. Kommersant writes that the situation is a paradox as this blockade had not been instigated by the president and the government, but they will have to shoulder the responsibility for it. "And possibly, quite soon," said MP of the pro-presidential Pyotr Poroshenko Bloc, Alexander Chernenko. Ukraine’s economy could feel the repercussions of the blockade in two or three months. "The consequences could be a decline in export and foreign currency and result in the hryvnia nosediving," Head of Ukraine’s Institute for Global Strategies Vadim Karasev told Kommersant. An MP representing the parliamentary majority has described the situation saying: "The government is in panic, we are in panic, and we will soon run out of hard coal." EU and US representatives have condemned the blockade that is ruining the Ukrainian economy. "Harsh steps and a disruption of economic ties may only worsen the Donbass dilemma. Such steps will not bring us closer to the implementation of the Minsk agreements," said an anonymous high-ranking EU diplomat in Kiev. Meanwhile, the West continues placing its bets on President Pyotr Poroshenko, considering his rival Yulia Timoshenko to be "a washed-up politician, who is also strongly associated with corruption schemes," he said. Despite harsh rhetoric between Kiev and Moscow, the Russian leadership continues maintaining contacts with Poroshenko and his team, Kommersant writes. However, the positions of Moscow and Kiev on many issues are irreconcilable and no preconditions for their rapprochement are in the cards. 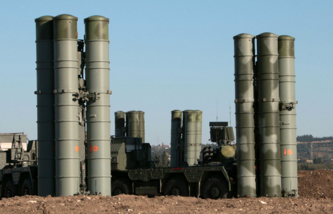 Based on the Russian satellite navigation system GLONASS (Global Navigation Satellite System), the "ecosystem" of weapons and military equipment played a pivotal role in Russia’s military intervention in the Syrian conflict, predetermining military success and a low death toll, according to research carried out by the Center for Analysis of Strategies and Technologies, Vedomosti reports. The GLONASS system, which became truly global in 2011, enabled the use of high-precision weapons such as cruise missiles and satellite-guided bombs, said Anton Lavrov, the author of the study called: "Russia’s New Military Possibilities in Syria." GLONASS bolstered the quality of planning of strikes and solved the problem of navigation for Russian aircraft in unknown territories such as the Syrian desert. This significantly boosted the capabilities for operations against insurgents in the area, the study stated. The precision of strikes was improved due to the massive use of drones in Syria, for the first time in Russia’s military practice. Their use would have been impossible without GLONASS, Lavrov said. Another important innovation was also the broad use of Russia’s special operations forces, including for directing aircraft, according to the research. These forces also performed such tasks as training Syrian troops, setting up ambushes and destroying crucial targets. The special ops forces of the US, France, the UK, Turkey and other countries part of the US-led coalition against the Islamic State (terror group, outlawed in Russia) are also being actively employed in Syria and Iraq, the study says. The top five consumers of Russian food last year were China (10.1%), Turkey (9.2%), Egypt (7.9%), South Korea (7.8%) and Kazakhstan (7.1%), RBC writes, citing the Russian Export Center. These countries were five major importers in 2015, but Turkey was the leader. China has been gradually increasing imports of Russian foodstuffs, the paper says. In 2013, it ranked just fourth among major importers, and in 2015 it took second place. Last year, China bought Russian food totaling $1.55 bln, outranking the previous leader, Turkey ($1.37 bln). China outpaced other countries as grain, which is the basis for export to Egypt and Turkey, became cheaper in 2016, Director for Export Policy and Analysis at the Russian Export Center, Mikhail Sneg, said. At the same time, the supplies to China also grew by 19.5% in monetary terms. The major goods imported by China in 2016 were fish, crustaceans and shellfish accounting for more than $1 bln or two-thirds of the overall amount of supplies, according to the Russian Federal Customs Service. Other popular goods from Russia are soybeans and sunflower oil. Their import reached more than $121 mln and $107 mln, respectively. Russia’s supplies to Egypt grew by 22.6% (to $1.2 bln) in 2016 and the Arab Republic moved from fifth to third place on the list of major importers. The deterioration in relations between Russia and Egypt did not create any obstacles to this, the paper writes.